A week ago, a mysterious package (taking the form of a used Safeway bag) arrived at my doorstep (actually handed to me by my aunt), unbeknownst to me (completely beknownst to me). What lay within was a blast from the past: one of my grandmother’s old knitting projects. I immediately noticed how good the yarn was, so, like any efficient knitter, I unraveled the project and blocked the yarn for one of my own creations. If you believe what I just wrote, I pity you and that cold, vacuous space in your chest. In actuality, this vest meant a great deal to me and my family. My father’s mother, who lived with us since I was born, was an avid knitter of vests that are only seen in a very specific population. If you’ve ever been to a red egg and ginger party or a twelve course banquet ending with red bean soup, you know the type of crowd I’m talking about. These are the women who’ve given birth in the rice paddies of China and returned to work the same day (or so they say). They’ve stowed away in tiny rowboats for days hiding from the Japanese and made herbal remedies from almost any animate object imaginable (and have been so kind as to feed these remedies to later generations). These are the type of people who don’t believe in the carrying capacity of a public transportation vehicle and who sell jewelry and television sets when they’re not being hair dressers. You know never to walk between these people and the walls of an alleyway because 9 times out of 10 they’ll shoot a 30 miles per hour snot-bullet at you using just the force of their breath (and the 1 time out of 10 you get by unscathed is an indication of mercy rather than inaccuracy). To them, the price tag is only a suggestion and it’s never too late to hustle a few dimes out of some chump in mah jong. They’re the type of women who like to name their children Wilson and Wellington and Cheston and Nixon. They are, in technical terms, “old Chinatown ladies,” and my grandmother was a shining example (Except for the pawn broker/barber thing. That’s just the lady who cuts my hair/sells me watches.). 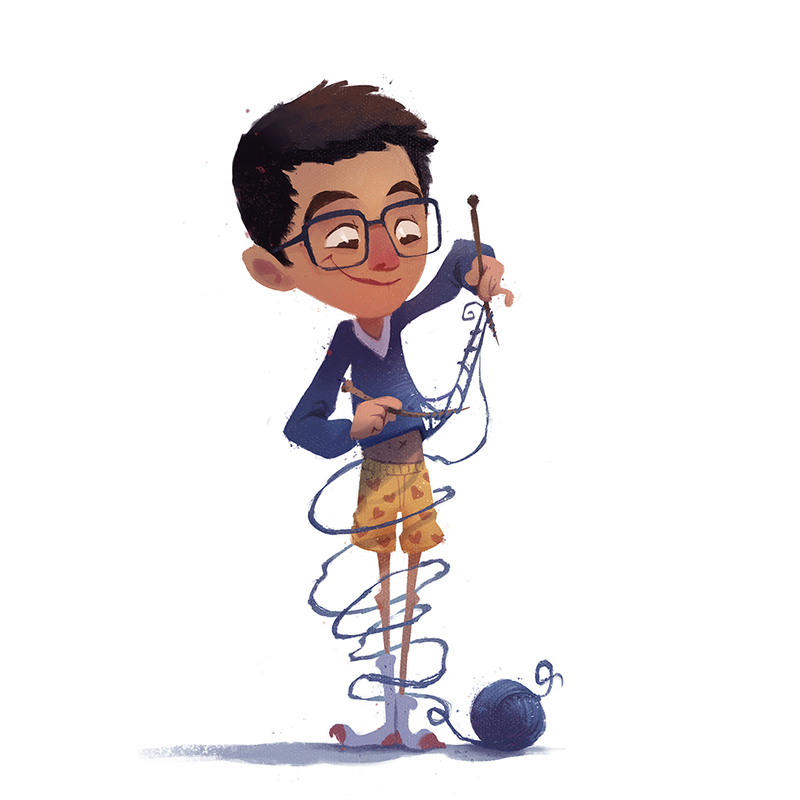 Anyway, my grandmother knit all the way until old age caught up to her, and, unfortunately, she had long since stopped knitting when I finally discovered my yen for yarn (I was debating between this, “need to knit,” “passion to purl,” and “itch to stitch.” It was a tough call.). And, now that she’s gone, I realize that this unfinished vest is the last thing I have that really connects us (besides the 25% of DNA we share). Her “final project” (It most likely was not her last project, but please grant me this romanticized allowance.) was essentially a secret language we shared. She had left the work mid-row, almost inviting me to analyze her stitching and to learn her pattern. She tied colored yarn around where the pockets, buttons, and neckline should be, as if she were telling me, “And make sure to pick up this many stitches here…and don’t forget about that…” I can honestly say that finishing this vest has been one of the most enjoyable knitting experiences I’ve had. “Able to cable.” That’s a good one, too. While trying to figure out what kind of stitch my grandmother was using, I learned that she was an incredible knitter. No joke. Every knit and purl is knit and purled exactly the same. It’s so even it doesn’t even need blocking (dare I say a word against blocking). And it wasn’t just me who saw the quality of her work. I received more compliments while working on this one item than I have on anything else I’ve made. A man even prophesied over me while I was making this (Apparently, God will stitch up my heart as I stitch up this vest.). My grandmother’s knitting was better and holier than mine. Well, eventually I somewhat figured out what stitch she was using and made a good enough guess to finish the back panel of the vest. 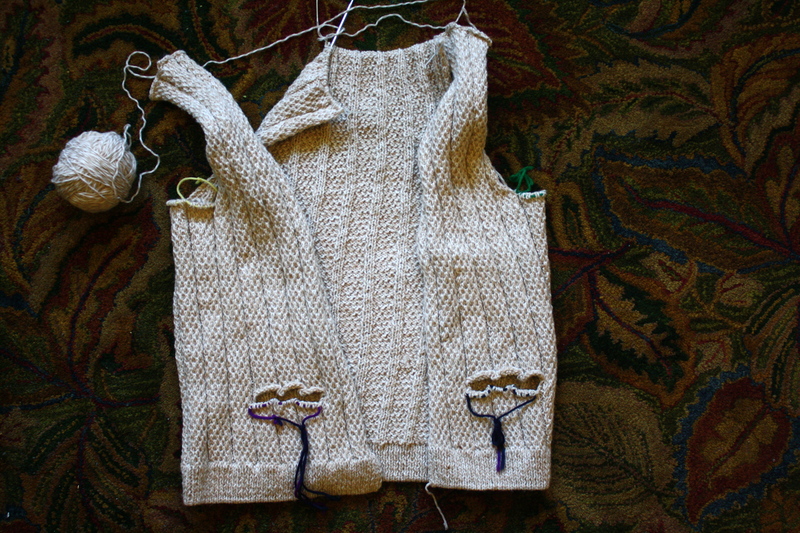 After that, all that was left to do was sew the front and back together, add edging to the neckline and arm holes, and knit the pockets. The latter was new to me, but because of my grandmother’s ghostly guidance, I figured out a way to make it work. So, if you plan on knitting pockets, here’s the way my grandmother did it (I’ll call this the Joyce method): Save the desired width of stitches onto a piece of scrap yarn. 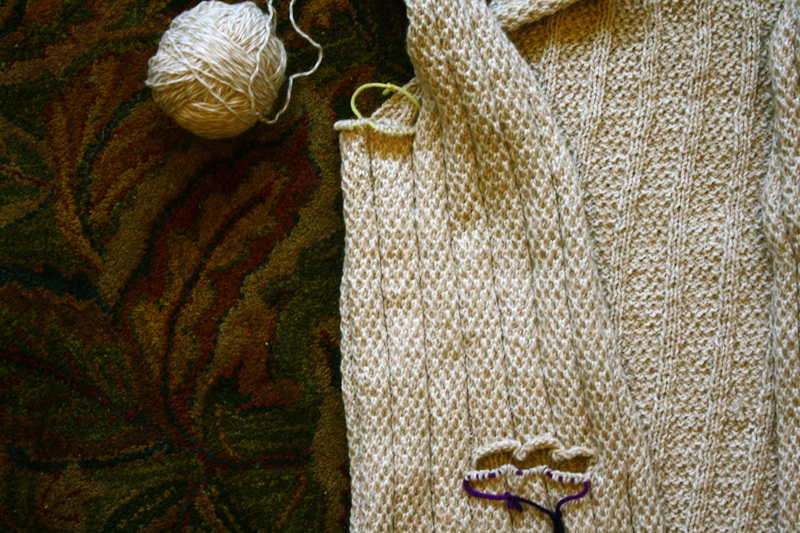 When knitting the following row, cast on the amount of stitches that you set aside. 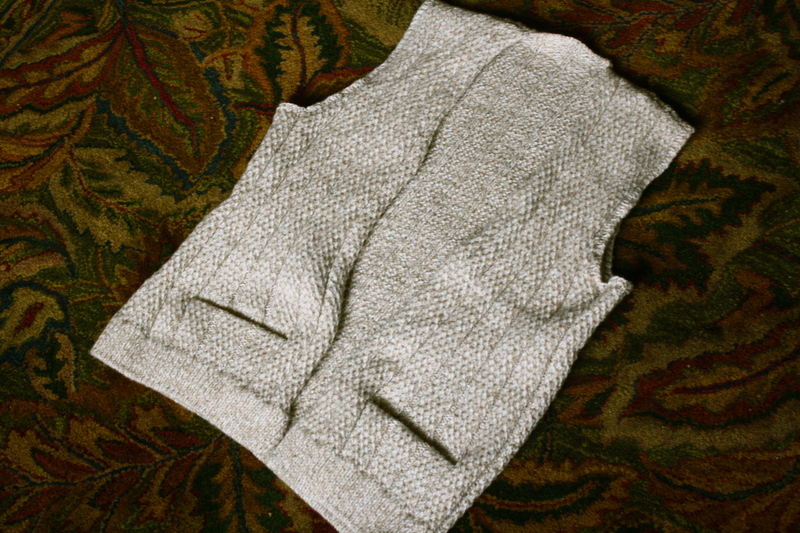 After you’ve finished the project, pick up the stitches that you saved and knit in stockinette until length is twice the desired depth of the pocket. Then, fold this flap up so the working edge matches up to where you first picked up the stitches. Finally, pick up the same amount of stitches on the row of stitches that you cast on (this should be the row above the stitches that you originally set aside), and use the kitchener stitch to graft them together. Block to receive the appropriate shape of the pocket. To be honest, when I initially saw the unfinished vest, I wasn’t thinking about what a sweet gesture to my family finishing it would be. Instead, I thought about how many movies have this exact same plot. Well, not exactly the same, but you have to admit, finding this gem is basically a watered down version of countless major Hollywood films. For example, Wanted: James Mcavoy takes down the organization that his father died trying to destroy. Mulan: Mulan brings honor to her family by taking her father’s role in the army. John Carter: John Carter leaves his nephew a journal, which the nephew uses to learn about his uncle’s history and ultimately send Taylor Kitsch back to Mars. The Italian Job: Charlize Theron joins her deceased father’s old team and plays the same role as master safe cracker in order to take down his murderer. Holes: Shia Labeouf has to fulfill the promise that his great-great-grandfather made to Eartha Kitt in order for the curse to be lifted. Need I go on? Well, I will, because I have one more left on my list. Harry Potter (the entire franchise): Harry takes down the evil wizard that his parents died trying to kill (kind of like Wanted, but without Morgan Freeman). As you can see, my story didn’t quite end up unfolding in the same manner as these. Instead, mine took an alternate path used by a lesser number of multigenerational, heart-warming dramas that is often shown on Lifetime. In these films, the protagonist is forced to interact with an older relative, but, after initial reluctance, learns that they are not so different after all and comes to understand the value of family and tradition. Sound familiar? Well, not to me, because I don’t watch Lifetime. I apologize, though. I really tried to make my life tell a more gripping story through this vest. But I just couldn’t find the Fraternity to my Wesley Gibson, the Huns to my Imperial Army, a Steve to my Stella, a Madame Zeroni to my– well, you get the point. ***Red egg and ginger parties are thrown for newborns at around 1 month of age because, traditionally, when the infant mortality rate was very high, a baby at this age had good chances of living to adulthood. this is really lovely, what you did, finishing your grandmother’s vest, thereby completing a project together and knitting love and memory into it. well written too. more stitches to you!